Having recently moved into the Ulladulla region, I have gradually settled into the local community and found referrals for my web design skills with both local small business owners and volunteer organisations. 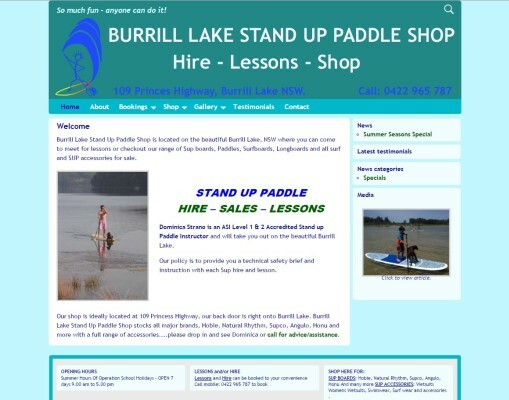 Dominica, the owner of Burrill Lake Stand Up Paddle board Shop was recommended to me by our local Milton Osteopath – Alison. This had me working with Dominica for a week in early December 2014 to create and launch her live website. Initially she had been trying to achieve results using the Wix system of template website development, however time and the necessary learning curve had stalled the project for a few months! I’m pleased to say we got it 99.9% up and operating within 7 days. Since then Dominica has received a good number of referrals and we have completed tutorials to assist her creating new posts for the site. Site mgt is with her totally.